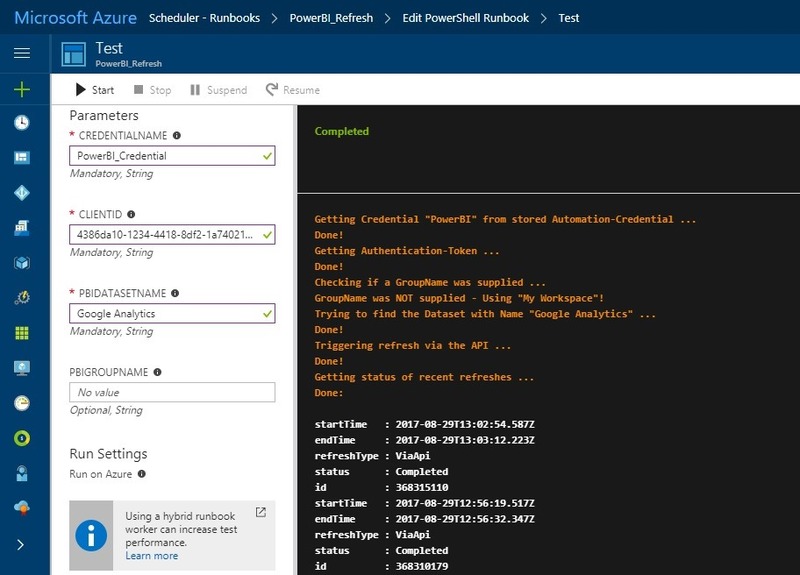 This entry was posted in Automation, Microsoft Azure, Power BI, PowerShell and tagged API, dataset, function, refresh, REST, runbook, trigger, update by Gerhard Brueckl. Bookmark the permalink. I personally like this style, but I don’t think there’s any functional difference. Invoke-RestMethod probably converts the hash tables to strings when called. just updated the code as it is indeed more readable! I always liked your posts and learn many things related to PowerBI or Azure. I got stuck with one of the requirement from my project, which I am unable to get any solution so far. the issue is that we are collecting data from on-prem using ADF and storing all the data in ADLS, same pipeline uses the aggregation using ADLA and generate one file and store it back in ADLS. so far until here all looks good and works fine, where I am struggling now is that my aggregated ADLS file is consumed by Power BI reports, when I do the manual refresh its working fine at Power BI side, but when I try to implement same using ADF I am facing lots of issues, even tried azure batch with ADF custom activity but no luck… have you ever faced such scenario? so you want to trigger a refresh of a dataset stored in PowerBI via ADF – correct? The sample application provided in the Git-Repository https://github.com/gbrueckl/PowerBI.API.Client shows you exactly what you need. You can also use the ADFLocalEnvironment (another Git repository on my site) to test it locally! Thanks this is very nice article, we have same scenario to refresh power bi dataset programmatically using ADF, we have written the code in C# and it is working fine locally and but it is not working in azure functions since it can’t load dlls that you mentioned in the above article. Later, we tried your approach using azure automation account (credential stored in it), and run the power shell script that was mentioned here. error”:”interaction_required”,”error_description”:”AADSTS50079: The user is required to use multi-factor authentication.\r\nTrace ID: fa7b0f4b-c0e8-42c7-9272-aa1320770300\r\nCorrelation ID: ce7afffa-4b22-4eaf-be24-255e434e10ca\r\nTimestamp: 2018-08-08 00:16:03Z”,”error_codes”:,”timestamp”:”2018-08-08 00:16:03Z”,”trace_id”:”fa7b0f4b-c0e8-42c7-9272-aa1320770300″,”correlation_id”:”ce7afffa-4b22-4eaf-be24-255e434e10ca”,”suberror”:”basic_action”} (The remote server returned an error: (400) Bad Request.). Can you help us if there is any fix that we can do to ignore mutli-factor authentication with above mentioned runbook powershell. Or is there any way that we can run C# utility in azure functions ? well, there is a purpose of multi-factor authentication – to require a manual step when someone is authenticating to approve the login. This can of course not work when you want to run a job as a service in an automated way. I had the same issue at one of my clients and the simplest solution is to create a new AAD User without multi-factore authentication set up, grant it proper permissions in Power BI and use that user’s credentials for your runbook. We are trying to find if there is any alternate to refresh power bi dataset in end-to-end workflow. Our goal is to include Power BI Data set refresh as soon as our data load is completed.We already have created c# utility to refresh power BI data set and it is running locally. If we want to use ADF ,how can we put this c# code into ADF pipeline (we tried to use httptrigger in azure functions, but it is failing to get access token). another option in ADF would be to use a custom activity where you can use your C# code. But from my experience, this can be quite nasty when passing in sensitive values. Any idea why the Azure Function fails? Did you eventually manage to refresh a dataset using ADF? could you also share the actual code that you are using? As the service normally allows only 8 refreshes a day under Pro, does this allow you to work around that number and increase the refresh rate of the datasets?